For information about the recent refurbishmentof Saint Peter's and about the new ossuary, please see the Culture24 web site. On 7 March, 2008, the new ossuary was blessed as part of a Requiem Eucharist in Saint Peter's for all those ancient citizens of Barton whose bodies were excavated in the 1980s and whose bones are now cared for in the Ossuary. For a picture and details of the service, click the Requiem page. The definitive history of St Peter's and St Mary's churches has recently been published: Warwick Rodwell: St Peters Church Barton-upon-Humber: a Parish Church and its Community. Volume 1: History, archaeology and architecture. Oxford, Oxbow Books, 2011. £75 ISBN 978-1-84217-325-1. The book covers in addition to history, the architecture, fixtures and fittings of the two churches. There is also much on the history and archaeology of the town and on the relationship between the two churches. Volume 2, which is a report on the skeletons excavated in St Peter's, appeared a few years ago. The Wilderspin National School, one of the earliest National (Church of England) Schools to be built and one of the few to survive intact, was the only school in Barton for many years. The building has been restored and is now open to the public Thursdays to Sundays from 10-00 to 17-00. For further information, see the web site. Vistors often comment on the lightness of the church, due to its relative lack of stained glass. 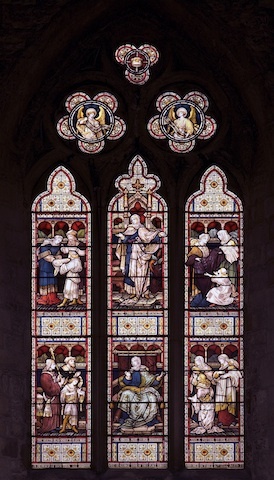 There is a single stained glass window in the South Aisle depicting themes from the book of Proverbs (ch 31, vv 15). It was made in 1887 by Daniel Bell, with the tracery lights being designed by the architect James Fowler of Louth.